southern orders : THIS IS WHERE POPE FRANCIS GETS IT TAKES 100 YEARS TO IMPLEMENT AN ECUMENCIAL COUNCIL--PIOUS OPINION OF ONE ELDERLY JESUIT IN 2013! THIS IS WHERE POPE FRANCIS GETS IT TAKES 100 YEARS TO IMPLEMENT AN ECUMENCIAL COUNCIL--PIOUS OPINION OF ONE ELDERLY JESUIT IN 2013! Rome — "I'm just beginning to understand the depth and breadth of the [Second Vatican] council" and its teachings, says a 91-year-old Jesuit who served as an expert at the council. Jesuit Fr. Ladislas Orsy, a visiting professor at the Georgetown University Law Center in Washington, told an audience Thursday in Rome that while every ecumenical council in church history led to debate -- and sometimes even schism -- it always has taken more than 50 years for a council's teachings and reforms to take root in the Christian community. "Granted we may see a great deal of confusion today; granted we may even see a denial of the council or we may even hear a way of explaining away the council," Orsy said during a speech that was part of the Week of Prayer for Christian Unity celebrations at Rome's Centro Pro Unione. Vatican II can be examined as a historical event, and theologians can use a variety of scholarly tools to propose different interpretations of its teachings, but one thing Catholics cannot deny is the church's teaching that the Holy Spirit is active in its ecumenical councils, he said. Orsy asked his audience, "Are you surprised that there is a bit of disarray today in the Roman Catholic Church when this happened in the case of Nicea, dealing with the very foundation of our faith?" The Council of Nicea in 325 affirmed the divinity of Christ. Nicea's deliberations led to debate and division, he said, but over the centuries "this wave of energy" of the Holy Spirit "quietly took possession of the church and the confusion sorted itself out." Today, he said, mainline Christians, while divided on a variety of issues, profess the basic tenets of their faith using the Nicean creed. "Just looking at what happened after Nicea," he said, "it is not farfetched" to think that the work the Holy Spirit began at the Second Vatican Council continues in the church and "maybe, shall we say, 100 years from now," people will recognize how deeply it impacted the church. 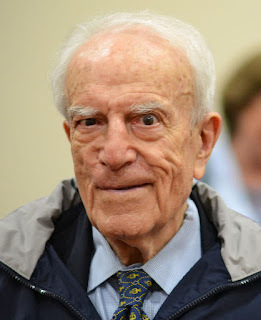 The Jesuit said he hoped to live a "few more years" so he could try to understand more about where the Holy Spirit is leading the church through the teachings of Vatican II and the continuing process of that teaching taking root in the lives of Catholics. In his talk, Orsy looked particularly at "Dignitatis Humanae," Vatican II's declaration on human dignity and religious freedom. The Jesuit canon lawyer said the document, approved on the last day of the council, takes the visions of the church, the world and the human person expressed in the other Vatican II documents and applies them to "real-life situations." It reaffirmed traditional church teaching that all human beings have an obligation to seek the truth and to strive for the perfection to which God calls all people, but it insisted the truth could be imposed on no one. The document insists on "respect for the truth, but asserts that charity has its own priority, sometimes even above truth," urging the church to model itself more closely after Christ, "who never imposed with any kind of violence the truth that he proclaimed." The council, he said, articulated a "fresh view of the human person" and affirmed that "by acknowledging the freedom of the human person, we honor a divine quality in the human person," who was created in God's image and likeness. The declaration, Orsy said, represented a transition from "the realm where the highest criteria for judging the person were abstract, general and impersonal truths to the realm of charity and love, where the normative rule is to honor the dignity of the person." "The ultimate conclusion is not to enforce the truth, but to embrace the person," he said. 100 years??? Nah, they're just "developing the doctrine" into whatever agenda they want, waiting for those who knew what the Church taught, die off. Then one day they'll say "see took 100 years for the FRUITS of VII to appear." Well, if my memory of Church history is accurare, in stark contrast to Vatican II, the Church began to recover well within 50 years following the conclusion of the Council of Trent. Funny he did not mention that inconvenient fact. I guess I should have added, unlike Trent, The Church was in great shape at the start of Vatican II which was not the case when the Council of Trent convened. So Vatican II harmed the Church and Trent helped fix the Church. I think it's already obvious how V2 impacted the Church. For one, Jesuits don't wear clerics anymore and most of the Jesuits have lost the faith. The Council of Trent was called to begin to address the MESS the Church had become. That mess was appropriately pointed out be the Reformers. Note that the mess had arisen long before Vatican II in the era of what posters here like to think of as A time of STRONG popes and bishops, priests who preached hell fire and damnation every Sunday, the universal celebration of the "Mass of the Ages," the not infrequent use of excommunication and interdict, no pastoral councils in parishes, no Eucharistic Ministers, male only altar servers, etc. If that atmosphere then could not prevent the Church from becoming a mess then, then why would it fix the mess we have now? Conversion of heart, not a return to the past, will be the needed tonic. Conversion of heart and recovering the Faith we have lost is the tonic. Hell fire and damnation seems to fit some of the more unhinged evangelicals than the Catholic Church. Pastoral councils, Eucharistic ministers, and female altar servers have added nothing to the deposit of the faith but tickle the egos of puerile, lefty pastors. The Council of Trent was part of a general reform movement, but it is highly misleading to suggest that the Church was in a 'mess' and the Council began to address it. By the time of the first session (1547) reform was well underway; the Jesuits had been recognized and St Philip Neri had begun his apostolate in Rome. Also, in the Church's history reform has never implied innovation; rather it has focused on the removal of abuses and a reaffirmation of sound doctrine and practice. The so-called reform of the second half of the 20th century did precisely the opposite; it undermined sound doctrine, overturned time-honoured practice, and allowed the proliferation of abuses on a wide scale. When I saw the photograph of Orsy I was struck by the likeness to Father Jack, the foul-mouthed and alcoholic retired priest in the sitcom 'Father Ted'.